Nothing says comfort like a plate of Instant Pot Beef Stroganoff! Chunks of beef cooked until tender in rich gravy loaded with mushrooms. Just like Mom used to make! Instant Pot Beef Stroganoff is the quick and easy version of this classic dinner favorite. Beef Stroganoff has always been one of my favorite comfort food meals. When we were first married (and for years after), I dreamed of making stroganoff. We couldn’t afford steak, so I made a ground beef version which I served over rice. I remember thinking someday I would be able to afford making “real” beef stroganoff. Back in those days, I used a recipe I found in an old cookbook which called for canned soups. It wasn’t especially appealing and when the dish was finished, it was kind of a grayish-brown color, and the ground beef was all crumbly… like I said, not really pleasing to the eye. Finally, 7 years (and a lot of tuna fish) later, Grant graduated from school and we had a little more money in our grocery budget! One of the first dinners I made was beef stroganoff. It cooked for hours in the oven, made or little house smell like heaven, and I felt like I had arrived. I’ve made Beef Stroganoff several different ways over the years. On the stove top, slow cooked in the oven, in a crockpot, and now in the Instant Pot. Instant Pot Beef Stroganoff is the winner in my opinion for many reasons. The stove top version never seems to get the meat super tender. It’s possible to cook meat until it is tender on the stovetop, but it never happens for me. I like the slow cooked oven version (275 degrees), and used it for years, but it literally takes hours, usually around 8 to get the meat to the desired consistency. Same with the slow cooker. TIME. The slow cooker usually takes about 8+ hours to achieve a fork tender piece of meat. 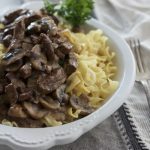 Compared with this recipe for Instant Pot Beef Stroganoff, it’s hard to beat an hour and 15 minutes versus 8 hours. Comparing time is not the only factor. After eating beef stroganoff cooked using all of the above methods, I believe Instant Pot Beef Stroganoff is far superior to the others mentioned. The meat is tender, moist and full of flavor. Instant Pot Beef Stroganoff is the clear winner in my opinion! Some dishes work by simply dumping ingredients in the pot, plugging in and in a few minutes, dinner is ready. Other meals require a little more prep. I’ve found that using the SAUTÈ mode helps the finished dish considerably when thickening the sauce or the appearance of the meat. You may also do this in another pan and then transfer to the Instant Pot. I only use another pan if I want to speed the browning process up. The surface of the Instant Pot is not very big, and browning of meat can’t happen very easily if the pan is crowded with too much meat or too many vegetables. With this recipe, I found that browning the meat in two batches worked best. I tried browning the mushrooms in the pot and also in a separate pan. I found that browning the mushrooms in a separate pan worked well for me because the mushrooms are removed from the Instant Pot and set aside while the meat cooked, so there wasn’t much difference to me if the mushrooms rested on a plate or in a pan where they were browned. The final step before serving this dish is to add a bit of sour cream or Greek yogurt. I’ve used both over the years and can say I like both. Greek yogurt has about 1/3 of the calories of full fat sour cream and WAY less fat. Low fat sour cream may also be used, but I’m not a fan of the low fat sour cream in this dish. I think it’s a bit watery. Greek yogurt has a bit more of a tangy and less creamy finish than regular full fat sour cream, but I don’t think the final result is noticeable unless you are eating a finished version side by side. If you’re not worried about calories, or if you are serving this to dinner guests, use sour cream. If you’re making this for your family and want to be a little more health conscious, Greek yogurt is a perfect choice! Make sure to only use Plain Greek Yogurt. The beauty of the Instant Pot is dinners that traditionally took hours to make are now easy to prepare and then place in the pot while you’re helping the kids with homework or running them to soccer practice or ironing napkins for dinner (hahaha). I use the Instant Pot all of the time, even when it’s just Grant and me at home. The Instant Pot has transformed our middle of the week dinner experiences. I’m making dishes that I traditionally reserved for Sunday dinner in the middle of the week because the cooking process is not an 8 hour affair! And really, what’s better on a cold rainy day than comfort food that tastes like it took hours to make? Enjoy! Turn the Instant Pot to the "saute" mode and heat for a few minutes, Add about 1 tablespoons olive oil and 2 tablespoon butter. Place sliced mushrooms in the pot, season with few dashes of salt and pepper and cook until browned. Remove from pot and place in dish. Set aside. Leaving the pot on the sauté mode, add the remaining 4 tablespoon butter to pan. Add chopped meat and brown. Season generously with salt and pepper while browning. After the meat has browned sprinkle with flour and stir a bit until the flour is cooked, about one minute. Add the chopped garlic, Worcestershire sauce, juice and broth. Place the lid on the pot, with the sealing ring in place, and the pressure valve turned to the "sealing" position. Lock the lid into place and set the timer to the "meat" setting (35 minutes). Meanwhile, cook the pasta or rice and set aside. You'll need about 2-3 cups of uncooked rice or about 1lb of pasta. Cook as directed on package, toss (pasta) with a little oil or butter and set aside. When the timer on the Instant Pot goes off and the cooking cycle is complete, let sit for another 20-30 minutes and allow the pressure to release naturally for best results. Carefully release any remaining pressure by using the pressure release valve and remove lid. Stir in cooked mushrooms, chopped parsley and sour cream or Greek yogurt. Turn pot to "saute" mode and let mixture heat up again, then turn to "off" position or "keep warm". Taste before serving, add salt and pepper if needed. -The amount of salt and pepper will vary according to your taste. I like food on the saltier side, so I use regular (not low sodium) broth and add salt to the recipe as well. -You may use other cuts of meat, but stay away from cuts that are too high in fat. I think Round Steak is perfect for this dish It is relatively inexpensive and cooks up nicely in the Instant Pot. -If the meat needs more gravy, you may add more broth after cooking. If you want to thicken the sauce, add a teaspoon of cornstarch to some water or broth (about 1/2 cup) and whisk together, then add to the pot while the meat and sauce are still hot. Stir until thickened. Remember, the sour cream or yogurt will also thicken the sauce a little bit. I am confused with the butter. It’s 4 tablespoons of butter but you only used 2? I may have missed something. Sorry, I corrected the recipe. It is a total of 6 tablespoons, divided. Thanks for the heads up! I too, love Beef Stroganoff, I stopped making it because I could never get the meat tender. I tried this recipe last night in the pressure cooker and loved it. The meat could be cut with a spoon. Although, I do have to say that I missed the sour cream. I tried the healthier option, but I think next time I will use the sour cream. Keep up the good work! I love your blog and tell everyone about it! Isn’t it amazing how the Instant Pot cooking method tenderizes meat? Glad you loved this recipe. Thanks for sharing your thoughts on the sour cream too! Would there be any changes to the recipe if I doubled the amount of meat? I like to make it in big batches to have leftovers for the week. Just purchased my instant pot two weeks ago and this is my favorite recipe so far! (Just shared it with Erin over at WellPlated.com! Was afraid the 3 T of Worcestershire Sauce was going to be too strong — it was absolutely delicious! Thank You for the delicious recipe of a classic dish. This has been my favorite recipe so far with my Insta Pot. Thanks Mary Ann! My daughter, Corrine, says this is their family favorite as well! Thank you so much for your positive comments! 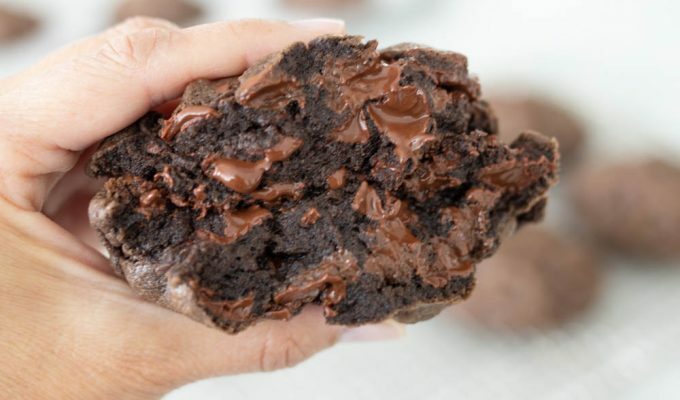 I’m glad this recipe got the “thumbs up” from your kids! Don’t waste your time with this recipe. Betty Crocker on the stove takes 38 minutes. Instant pot 90 minutes, not including slicing and prepping time. If you like your stroganoff soupy, you will love this. It also dirtied an enormous amount of dishes, which I did by hand. I prefer the hamburger helper version of this. Made this tonight and really enjoyed it. Meat was tender and I love that it calls for lots of mushrooms! The sauce was pretty thin and just wondering if that is how it is supposed to be? It was really too thin to serve on plates….we really needed bowls. Should I add more flour the next time? Some readers have commented that they have added more flour or cornstarch to the recipe to thicken a bit. Try that next time and let me know how it works for you. We LOVED this stroganoff!!! I used 2 lbs. of top round steak instead of just 1 1/2 lbs. and used 2/3 cup greek yogurt. I also used a little cornstarch at the end because I love a thick sauce. The flavors were so rich and delicious! I couldn’t stop sneaking extra bites as I was cleaning up dinner. Another amazing ABK recipe! I’m glad the stroganoff was such a hit at your house! Thank you for reading ABK. Let me know if you try any of my other IP recipes. Grew up with the traditional hamburger/canned cream soup stroganoff. Believe me, I still love it, brings back so many memories. But last night, I wanted a step up from hamburger. Last minute decided to try this recipe. So glad I did! The meat was so tender and the gravy so creamy. My picky twins LOVED it. Easy to make with simple ingredients. Thank you! I always love to hear one of my recipes has pleased a picky eater! Thank you for your positive feedback. Made this last week and it was a huge hit! Doubled it to freeze the rest and worked out great. For some reason it was a bit thin for me, so while heating it back up at the end with the yogurt I added a little bit of cornstarch and water. Thanks for the delicious, homey recipe! It’s a keeper for sure. Thanks for your comments and tips, and thanks for reading ABK! I am dying to try this recipe! I have impressed many a friends and family with your instant pot beef stew recipe. Quick question, though. What happens if you omit the flour? I am trying to use only non-gluten grains. Thanks in advance! You will need something to thicken the sauce, If you are gf, try removing about 1/2 cup of the liquid after cooking and then whisk in a tablespoon of cornstarch until smooth and then add back into the IP while it is on saute mode. It should thicken the sauce without using flour! Great flavors and easy recipe! I love how tender the meat gets in the pressure cooker, and it tastes really good! My young children love it too. I add a small yellow onion when I sauté the mushrooms at the beginning because I like to taste both garlic and onion in my stroganoff. SO glad you love this recipe. Thanks for your feedback and thank you for reading ABK! Such an awesome recipe! It was so easy to make and the meat was so tender I couldn’t believe it. I didn’t have any cornstarch so I added some flour at the end to thicken the sauce just a little bit. It wasn’t really needed though, because the sauce is so good on its own. My husband asked for it twice in one week, it was that good. I’m glad this recipe was a hit with your family! I love having a go-to recipe I know everyone will enjoy! Thanks for your positive comments and thanks for reading ABK. This is my all time favorite instapot meal! Hi there! So excited to try this… I don’t have a pressure cooker…do I just follow the instructions and cook it in the crock pot all day instead of the pressure cooker? I definitely don’t want my meat tough! Thanks so much! You will need more liquid to cover this to a slow cooker recipe…and Ive found that beef stroganoff needs about 8 hours on low to produce a tender meat in the slow cooker! How much more liquid? I am wondering the same thing! I’d use 2 1/2 – 3 cups broth for a slow cooker recipe. Please write back and let me know how this recipe worked for you. This was the first dish that I made in my IP. My IP sat in my cupboard for over a year because I was so intimidated to use it. This dish was so easy to make and the meat was so tender. I will definitely make this dish again. It is one of my families favorite dishes. Keep the IP recipes coming. I’m glad you finally opened your Instant Pot and used it. Keep cooking with your IP and soon you’ll be wondering how you ever lived without it! Thank you for your wonderful feedback. I’d love to hear your thoughts on my other IP recipes. Thank you for the recipe. The flavors were point on! Followed some reviewers advice and added a cornstarch slurry but still was very thin. Next time will add more flour after neat browns. Also my meat was just in bits. I guess I will qr next go around. You’re welcome, Janet. It tends to turn out differently depending on what you use, thanks for sharing!